An Ohio teacher, who came to Kansas in 1857 to farm. Had been with Price at battle of Lexington, Missouri in September 1861. Quantrell left the army to organize his group of Partisan Rangers. His rides and missions are legendary. Most famous was the "Pay Back" at Lawrence Kansas on Aug. 21, 1863. This Northern born adopted son of the south has been called many things by both sides during the Civil War from a Savage Blood lusting murderer to Saintly Guerrilla fighter. His comand was responsible for the massacre of over 150 people in Lawrence Kansas on Aug. 21 1863 starting at 5 AM and ending near midnight. At this point even the Confederate Govt. Washed their hands of this boy. Later in his service, he was trapped in barn close to Smiley, Kentucky by Edward Terrell and his cavalry detachment of hired assassins on the James H. Wakefield farm on May 10, 1865. While attempting to escape, he was struck by two Spencer balls, one in the hand, the other paralyzing him from the waist down. Transferred to a military hospital in Louisville, then to a Catholic Hospital in Louisville. He died there at 4pm, June 6, 1865. He was buried in the old Portland Catholic Cemetery at Louisville. In 1887, his mother had his bones brought back to Ohio. The man she paid to remove the body stole some of the skeleton, and years later, parts of it showed up in the hands of a Kansas collector. On October 24, 1992, his mortal remains laid to rest at the Old Confederate Home in Higginsville, MO, and re-interred in the Confederate Cemetery there. William Quantrell joined the Confederate Army on the outbreak of the American Civil War. He fought at Lexington but disliked the regimentation of army life and decided to form a band of guerilla fighters. As well as attacking Union troops the Quantrill Raiders also robbed mail coaches, murdered supporters of Abraham Lincoln and persecuted communities in Missouri and Kansas that Quantrell considered to be anti-Confederate. He also gained a reputation for murdering members of the Union Army that the gang had taken prisoner. In 1862 Quantrell and his men were formally declared to be outlaws. By 1863 Quantrell was the leader of over 450 men. This included Frank James, Jessie James, Cole Younger and James Younger. With this large force he committed one of the worst atrocities of the Civil War when he attacked the town of Lawrence. During the raid on 21st August, 1863, Quantrell's gang killed 150 inhabitants and destroyed over 180 buildings. The district Union commander, General Thomas Ewing, was furious when he heard what the Quantrell Raiders had done. On 25th August 1863, he issued Order No 11. This gave an eviction notice to all people in the area who could not prove their loyalty to the Union cause. Ewing's decree virtually wiped out the entire region. The population of Cass County dropped from 10,000 to 600. Quantrell found it difficult to keep his men under control and they tended to go off and commit their own crimes. By 1865 he had only 33 followers left. On 10th May 1863 Quantrell was ambushed by federal troops. William Quantrell was shot and died from his wounds on 6th June, 1865. PURPORTED QUANTRELL GRAVESITES: The name on this stone in this Augusta cemetery is L. J. Crocker, but local amateur scholars have been trying to prove for decades that the bones beneath belong to feared Confederate partisan cavalry commander William Clarke Quantrell, or if you prefer, Quantrill (po-tay-to, po-tah-to). 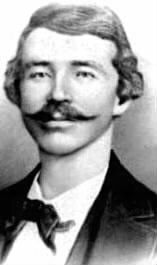 Through the years, there have been many discussions, debates and even arguments on the spelling of William C. Quantrill's name. Is it Quantrill -or- Quantrell?? There are those even today that do not know the correct spelling due to old newspapers, articles, magazines, Field Orders, etc. Well, the answer is quite simple and amazing. We owe this debt of solving the mystery to ex Missouri Partisan Ranger, Mr. George Shepherd. The legend and spelling of the name QUANTRELL came about by a 20 year old girl named Annie Fickle who lived in Lafayette County. In May of 1862, Annie's family home had been invaded by a company of Federals, and they arrested Annie when she was found to be in the company of a Partisan Ranger. Later, Annie had been rescued by the Partisans, and she never forgot this. As a token of her appreciation, Annie made a battle flag for the Partisan Rangers. The flag was made of four layers of black, quilted alpaca, and was three by five feet. Running edgewise through the middle of the flag was the name QUANTRELL in dark red letters. Annie, in the dead of night, took the flag into Quantrill's camp, wrapped in a piece of plain paper. William C. Quantrill accepted it himself, and gave a deep and heartfelt thank you to Annie. Quantrill's men then gave 3 cheers, waving their hats, and giving full approvals, honors and recognition to this 20 year old Missouri girl who had risked her life to make this gift. The men attached the flag to an eight foot pole of oak, attached with 12 nails, and were quite proud! This flag was carried into many battles, such as Lawrence, Kansas, and was riddled with many bullets. Quantrill even took it with him into Kentucky in 1864, but it has sadly not surfaced since.